Every day there are a number of significant stories that come my way that I do not have time to make in depth comments on. Here is a collection on my stack worth a quick peek. Google Inc.’s threat to pull out of China is the most visible reflection of U.S. companies’ growing disillusionment with the country nine years after it joined the World Trade Organization, business groups said. Washington trade organizations representing companies such as Microsoft Corp., Boeing Co., Intel Corp. and Cigna Corp., which all backed China’s entry into the WTO and fought off legislation to punish Chinese imports, say China is increasingly discriminating against them on government contracts and through unfair subsidies. Google, owner of the most-used search engine, said Jan. 12 that it would end self-censorship of its product in China after attacks on e-mail accounts of human-rights activists. The Mountain View, California-based company said the move may cause it to close offices in the country. Such comments from longtime backers of U.S.-China relations represent growing dissatisfaction among U.S. companies, said Susan Aaronson, a professor at George Washington University in Washington who writes about U.S.-China trade relations. This story is far more significant than the play it will get. It signals growing protectionism as well as dissatisfaction with dealing in China. To top things off, Chinese money supply is growing completely out of control and it is only a matter of time before China implodes or explodes. More on that in another post later. Facing hard-line forces on the streets, Iran’s anti-government demonstrators have taken their protests to a new venue: writing "Death to the Dictator" and other opposition slogans on bank notes, while officials scramble to yank the bills from circulation. "What did they die for?" asked one message on a bill, referring to the estimated dozens of demonstrators killed in the wake of vote-rigging allegations in last summer’s re-election of President Mahmoud Ahmadinejad. I have been talking about the Job Loss Recovery for quite some time. Here are a few recent examples. Given that the Fed’s first mission is to delay, confuse, hope, and otherwise attempt to buy time while engaging in wishful thinking along the way, that Bernanke is willing to admit this may be a jobless recovery is a sign that things will likely be at least that bad. In other words, prepare for a job loss recovery. August 3: Thoughts On The "Recoveryless Recovery"
Most know that I am in favor of an "L shaped recession", but that definition includes a "WW" or even a "WWW" where the economy slips in and out of recession for a decade, as happened in Japan. 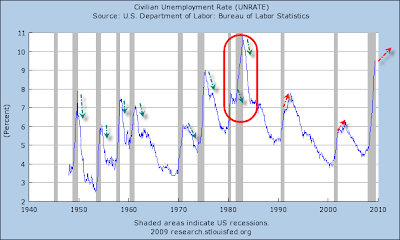 The last three recessions are unlike the eight preceding recessions. For numerous reasons described below we are heading for another job loss recovery. 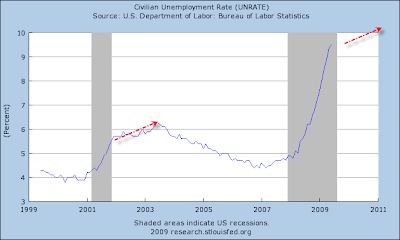 If the pattern holds, unemployment will rise until 2011 or beyond. So while everyone is tooting horns and cheering the end of the end of the recession before it has even ended, those graphs and comments from Bernanke himself will put the pending job loss Recovery into better perspective. What is bringing this idea to the forefront now is all the enthusiasm over what is destined to be the weakest recovery ever. Others seem to be catching on. Please consider Experts see rebounding economy shedding jobs. Forget a jobless recovery. The economy may be entering a recovery with job losses. Third-quarter estimates this week are expected to show that the economy grew for the first time since the quarter ending in June 2008. Despite the estimated 3 percent expansion and a stock market that has been on a tear since March, hundreds of thousands of people are still being laid off each month.